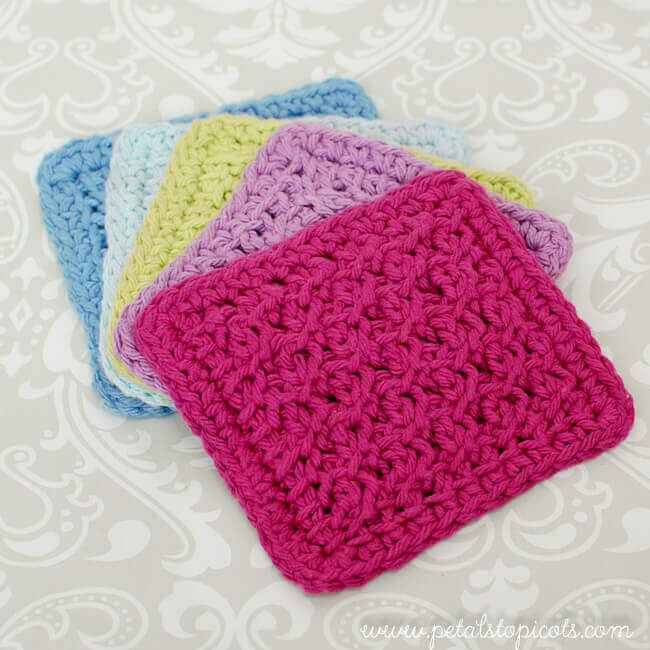 This Tunisian crochet coaster pattern works up so quickly so you can make a set of charming coasters for your home or to give as a gift! It’s also the perfect size for practicing your stitches! If you are just getting started with Tunisian Crochet, you can check out my Learn Tunisian Crochet in a Week series to help you get started. I have also included links to stitch tutorials below for the stitches used in this pattern. You can also check out my matching Tunisian Crochet Kitchen Mat Pattern here. Tunisian cross stitch pattern from The New Tunisian Crochet by Dora Ohrenstein. Finished coasters measure approximately 4½ in. × 4½ in. Notes: Work basic return pass throughout. If desired, you can reference a stitch diagram of the cross stitch repeat pattern used by clicking here. Row 1: Work Tss in each st across — 14 sts. Row 2: Loop on hook counts as 1 Tss, *sk next vertical bar, pull up a loop in next vertical bar, pull up a loop in skipped vertical bar (cross st made), 2 Tps, rep from * until last st, work 1 Tss — 14 sts. Row 3: Loop on hook counts as 1 Tss, *2 Tps, sk next vertical bar, pull up a loop in next vertical bar, pull up a loop in skipped vertical bar (cross st made), rep from * until last st, work 1 Tss — 14 sts. Rows 2–11: Repeat rows 2 and 3 for pattern. Row 12: Work Tss in each st across, return pass — 14 sts. 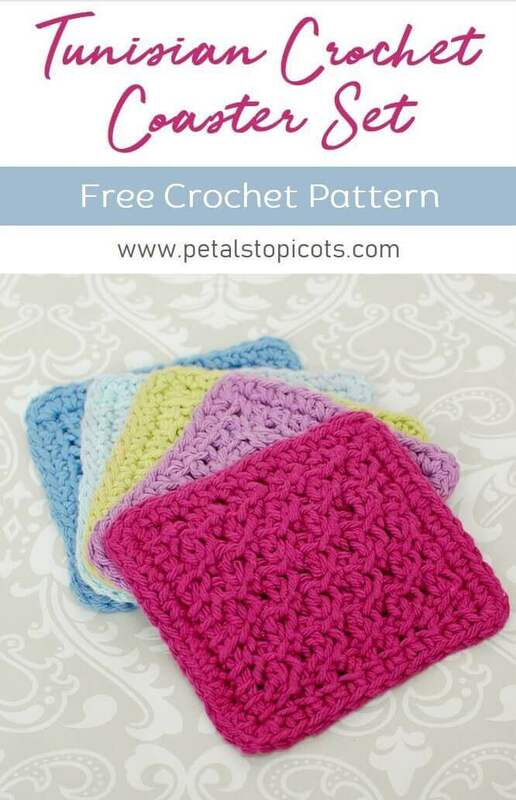 If desired, a single crochet border can be worked around the coaster by working 1 sc in each st and 3 sc in each corner. Click here for more of my free Tunisian Crochet Patterns.